I have the most amazing page from that magazine, which I found in my favorite little antique store. I'm partial to this particular store for several reasons, one of which being that it was (back in the good ole days) a skating rink. I distinctly remember the agonizing pain of not being able to skate backwards at a birthday party and wishing for my mother to come pick me up. Now it is a much friendlier place to visit, with booths crammed full of old stuff, some stuff posing as old, some REAL old stuff that is almost creepy...you know. Some time last spring I went in to discover that the first booth on the left was having a going-out-of-business sale. 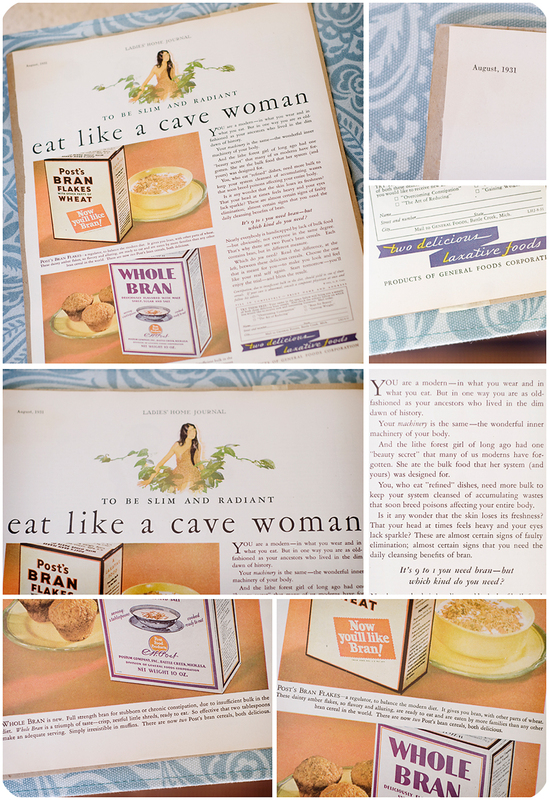 And there, tucked behind a ceramic German mug & a rotary phone was this beautiful advertisement from LHJ...for Post Bran Cereal..."two delicious laxative foods". I think I paid $1.60 for it and though I have yet to find a frame (because this NEEDS to be hanging in my kitchen! ), it is by far one of my favorite little finds. Below the image is the full text of the ad...because you're really gonna want to check it out. YOU are a modern -- in what you wear and in what you eat. But in one way you are as old-fashioned as your ancestors who lived in the dim dawn of history. Your machinery is the same -- the wonderful inner machinery of your body. And the lithe forest girl of long ago had one "beauty secret" that many of us moderns have forgotten. She ate the bulk food that her system (and yours) was designed for. You, who eat "refined" dishes, need more bulk to keep your system cleansed of accumulating wastes that soon breed poisons affecting your entire body. Is it any wonder that the skin loses its freshness? That your head at times feels heavy and your eyes lack sparkle? These are almost certain signs of faulty elimination; almost certain signs that you need the daily cleansing benefits of bran. It's 9 to 1 you need bran - but which kind do you need? Nearly everybody is handicapped by lack of bulk food -- but obviously, not everyone in the same degree. That's why there are two Post's bran cereals. Each contains brain, but in different measure. Which do you need? Read the difference at the left, between these delicious cereals. Choose the one that is meant for you -- to make you look and feel like your real self again. Start tomorrow -- you'll enjoy the trial -- and bless the result. Constipation, due to insufficient bulk in the diet, should yield to one of these cereals. If your case is abnormal, consult a competent physician at once and follow his advice.